"Is Goa A Halal destination?" That was the first question that popped up my mind when I came across Alila Diwa Goa. Always having heard of Goa being famous for their party scenes, and night life, I was quite skeptical what kind of place I would be venturing into when we decided to go to Goa. So How did it go? All those questions you have in mind when it comes to seeing what kind of a destination it is, I have put it down here. So, Let's find out! Where did we stay? What was the local scene like there? Our stay was at Alila Diwa Goa in Majorda which is in South Goa. The Alila Diwa Goa perfectly blends the best of Goa architecture, local heritage & closeness to nature very well. The Hotel has used local red laterite stone which is very prominent in Goan architecture, very easily found & polished Kota stone. The Goan presence can be seen all over the interior through simple furniture with clean lines. Although, the beach is barely 200-300 metres away, it is not within the resort premises. We were welcomed into the Hotel with a welcome drink, and a shoulder massage. I mean what better way to welcome to a realm of rejuvenation. This was the view just outside our room right before we entered into it. The room was like a little apartment in itself, with a spacious balcony, a walk-in wardrobe, a stand alone bathtub, and separate rain shower, and toilet. It was everything that you needed to relax, and even perhaps run around, and play hide, and seek with Mr. M.
As we were staying in the Alila Diwa room, we had access to an exclusive smaller pool, an open air Jacuzzi as well as a private all- day dining Bistro. The breakfast concept at Bistro was a clear winner for me. They have a lazy breakfast concept which I thought was an excellent idea, especially those holidays where you are spending your days in a hotel, and you want to sleep in but don't want to miss the breakfast. So, you are forced to wake up early. The concept of Lazy breakfast is such that you can have this anytime of the day. You order it off the menu. This was part of the services at the restaurant we had access to as we were staying in the Alila Diwa rooms. Their buffet breakfast in the all-day dining VIVO is an affair on it's own which we didn't get to experience as we decided to sleep in. Chai Pani is an afternoon tea concept that has been put together as an experience for guests where tea is served the traditional way, and Indian street food is served on the table. 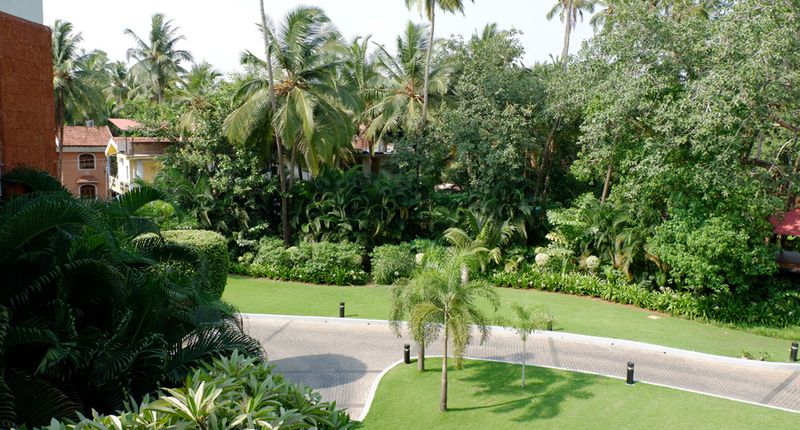 With a view of the pool, and the lush greenery it makes for a great experience. The Chai Pani menu is one that rotates, and is different every day. While we were there, we had homemade cumin cookies which was really soft, flavorful and delicious. Our experience included Delhi Aloo Papdi Chaat, Bhelpuri, Panipuri and Sevpuri. We also happened to try the traditional Goan buns which were referred to as Paos, and also got an insight into a little bit of the cuisine history from Alessandrea who accompanied us and gave us a tour of the property. The Chai Pani was served at Bistro as well. We had dinner at Spice Studio, and indulged in Pure Goan cuisine from the hands of the chef. The restaurant is located on an elevated platform that is around a banyan tree. You get to choose from the fresh catch of the day, and the selection is cooked as per your preference. The food being made is something within our view, and it definitely gives a very homely feeling to the experience. The main area also has an infinity pool to accommodate the guests of the Alila Diwa. The pool is claimed to be the second best infinity pool in India. It sure is deserving of it, don't you think so? This property is quite different from other resorts in Goa is that it is surrounded by lush green plantations, gardens, swaying palm grooves and sparkling waters of the Arabian Sea. It takes you away from the noise of city life, so that you enjoy your stay feeling calm and serene. Another aspect of the resort that I really liked was the little vegetable/ fruit farm they had. Guests could pick the fruits and vegetables of their choice, and a meal would be ready for them. The resort has a beautiful spa, more than anything the resort was made to be in touch with nature. Every detail was well thought out. The way to the massage rooms from the spa reception was lined by lotuses in water. Each spa room stood independent, and I am guessing had a stand alone open shower where you could see the stars above you, and plants on your side. I would totally recommend having a treatment at their spa - my therapist was Divya, and she took care of me very well. I had a long journey from Indore to Manali to Hyderabad before my stop at Goa, and hence, this was much needed. 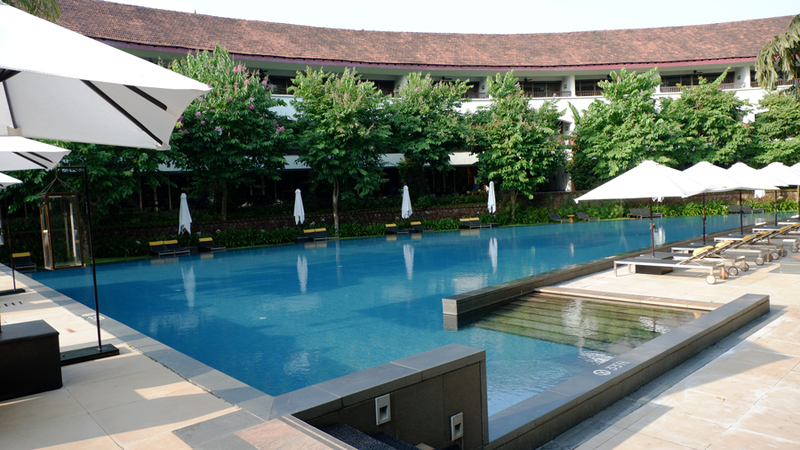 Not only the spa, the stay, the rejuvenation, and every little moment at Alila Diwa was worth it. This resort has certainly been designed keeping in mind the needs of a luxury traveler who travels with family and friends.There are facilities like Kids Club, Kids pool, private mini theater, Library, Fitness Center, salon and more making sure every one has something to do. 7 minutes walk away from the resort is Goa's, and perhaps one of India's cleanest, and untouched beaches. I walked into the beach not knowing what to expect. There were horses roaming in the fields, and cows grazing on our way to the beach. Not crowded at all, very clean so much that you could see the reflection of the clouds in the sand very clearly. 3 days is good time to explore the resort itself, and go around the South of Goa. However, no matter how much time you spend in the beach it's priceless! That being said, my whole fear of experiencing Goa was blown away thanks to being here. For anyone like me, I would totally recommend a stay in Alila Diwa Goa, and the beach close to it. It's more the laidback part of Goa devoid of the party scenes we have always heard of, and obviously a new destination to explore. Disclaimer: This post was done in collaboration with Alila Diwa Goa. However, all pictures, and opinions here are my own.